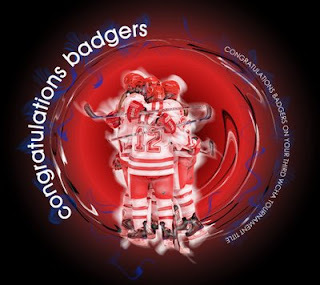 The Badger women's hockey team will be headed to their fourth straight Frozen Four starting next Friday in Boston after a dominating quarterfinal victory over Dartmouth today. Patty Kaz finalist Jessie Vetter made 32 saves and helped completely blank Dartmouth's number two in the nation power play unit over five opportunities. The shut out was Vetter's 38. Hilary Knight had a career-high six points, scoring two goals and adding four assists. Angie Keseley added a hat trick and two assists. "Knight, who entered the day second in the nation in goals per game (1.11) and points per game (1.97), scored two goals and added four assists. She had both goals and three assists in the first two periods as UW built a 5-0 lead. Lawler, who entered the day No. 1 in the nation in assists with 39, recorded a goal and two assists. Vetter stopped 32 shots to set an NCAA record for shutouts in a season with 13. She added to her two all-time NCAA marks, victories (89) and shutouts (38)."